Worm farms are a good way to compost. Composting your garden and food waste has many benefits and is quite easy to do. It keeps waste from landfills, provides nutrients to your plantings and improves the drainage and moisture absorption of your soil. It also reduces the amount of fertiliser and pesticides needed to grow healthy plants. Worm farms are relatively simple to make and care for. The worms used are tiger worms, available from some garden centres and other specialist outlets. Purpose-built worm farms can be bought, or you can make your own using an old bath or other container, or a contained area on the ground. A 10cm layer of bedding material should be put along the bottom of the worm farm. The bedding material should consist of shredded newspaper, cardboard or old carpet. A thin layer of compost can be spread over the bedding material for the worms to be put in initially. The food is spread over the compost and bedding material and the worm farm should have a fairly strong cover such as carpet, thick cardboard or untreated timber to keep the environment dark and moist with temperatures between 18-26 C.
The worms will eat food scraps (cooked and raw), tea bags, coffee grounds, bread and other organic waste but limit the quantity of citrus, onions and garlic. They will eat their body weight in food every day. Keep out meat, dairy and oils. Check the conditions of the worm farm when you put the food in. When a reasonable amount of worm compost (or castings) has been formed move the bedding to one side and put in new bedding and food on the cleared side. Leave for a few days for the worms to migrate to the new bedding and food. Remove the old bedding which is now ready to use as fertiliser. 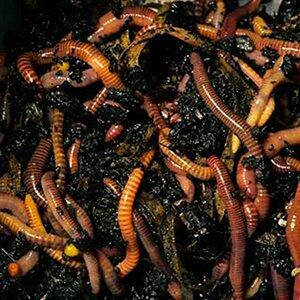 If your worm farm is in a bath the liquid wastes (worm tea) can be collected in a bucket under the plughole. This can be used as a very effective fertiliser by diluting, if necessary, until it is the colour of weak tea. Pour warm tea on the ground around plants to fertilise rather than on leaves.